A lottery system for food truck operators in the District of Columbia started Monday. The new system, which begins Monday, will allot assigned spaces to participating trucks for their exclusive use every weekday. They'll be able to park in the spaces for four hours. District officials say the lottery is intended to bring predictability to the city's food truck scene, which until now has permitted operators to park wherever they choose. The assigned spaces are located in spots where trucks tend to congregate to serve the lunch crowd, including Franklin Square, Farragut Square, L'Enfant Plaza and Metro Center. Trucks that don't participate can still sell food on district streets, but they have to stay at least 200 feet away from the designated locations and pay parking meter fees. 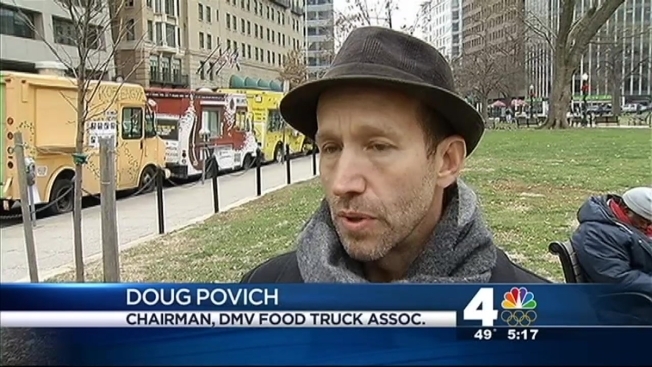 "The benefits now for foodtrucks are that they're going to come to customers and the city is going to recognize tax revenue and permit revenue, and I think it worked out well with respect to restaurants as well," DMV Food Truck Association Chairman Doug Povich said. "We're very pleased that it has happened the way it has." Back in June, D.C. Mayor Vincent Gray signed a bill governing the growing food truck industry. The bill reduces parking violations from $2,000 to just $50 and the amount of unobstructed sidewalk required to vend from 10 feet to 6 feet.